DECK-O-DRAIN is packaged 100’ (30.48 m) per carton, including nailing clips, couplers, and protective tape over drain surface. NOTE: Nail clips should be placed on every other stake. Packaging includes 20 nail clips per box and nine couplers per carton. Concrete expands and contracts with temperature and moisture changes. As the temperature rises or the moisture content of the concrete increases, expansion takes place. As the temperature drops, the concrete will contract. The provision to accommodate movement at predetermined locations with proper joint applications prevents the development of stresses that could rupture the concrete. 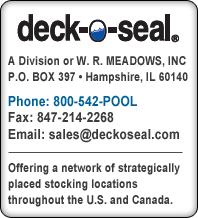 Refer to our Control Joints #320 data sheet for a full listing of expansion joint products to protect pool decks from this movement. Consult with a structural engineer for proper placement.